In this newsletter, we’d like to focus on the value of adopting the mindset of whole body health and wellness. Optimal breast health begins (and ends) with optimal overall health. Today, we will show you one example of how one client, Sara, utilized thermography in a whole body scan to address overall wellness. Diet: Gluten-free diet; dramatically decreased carbohydrates; and increase in protein throughout the day. Medications and supplements: Stopped Synthroid (synthetic medication) and started using Iodizyme (natural replacement); increased B-vitamin supplements. Spiritual and physical health: Chiropractic treatments; energy practitioner to address emotional issues; a structural integration/myofascial release therapist; and a deep tissue massage therapist. Medical interpretation Mar. 2011: The circumoral hyperthermia, along with the hyperthermia over the sinuses, may represent a neurogenic flare, which can be seen in fibromyalgia-like syndromes. These patterns indicate a possible autonomic dysfunction, suggesting that this individual’s immune system is chronically activated. Contributing factors could include food allergies, pro-inflammatory diet, dental pathology, hormonal imbalances/deficiencies, hypoadrenia/chronic stress, heavy metal toxicity, low-grade chronic infection and systemic illness. 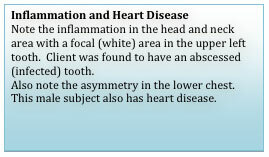 Medical interpretation Mar. 2011: These patterns of inflammation demonstrate myofascial dysfunction and joint inflammation. The patient is to be commended on making significant health changes and in getting a good response, particularly related to sleep. As you know, sleep is essential to the body restoring itself, particularly the adrenal gland. Inflammation is ALWAYS the beginning of disease and can lead to future organ dysfunction, chronic disease or incessant pain. 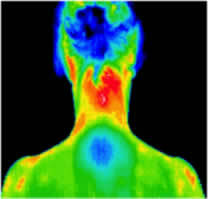 Thermography sees inflammation and affords you the opportunity to make changes to reduce or eliminate inflammation. Like Sara, it can be used to monitor success of modifications that ultimately improve health. Sara understood that wellness can be attained on many levels; physical, mental, emotional, energetic, spiritual, etc. and she was not willing to choose only one path. She chose many, all leading her toward wellness. Thank you all for being a part of our lives. Each and every one of you has enriched our personal tapestry of life. We will forever be grateful for your presence in our world. As we move towards fall, we would like to review for all our new, and maybe some of our established clients, the four benefits of thermal imaging. This client maintains good symmetry with no significant thermal findings. 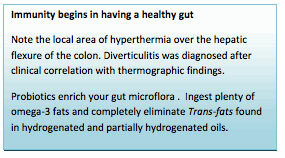 Embedded temperatures allow reading MDs to determine stable physiology and low risk for developing disease. This client had significant vascular activity in the left breast, not seen in the right breast which clinically correlates with fibrocystic changes. Thermal asymmetry is a risk factor for future disease. This client is a good candidate for early intervention. Case study #3: A woman positively influences her breast health by making lifestyle choices to aid in decreasing risk factors. This T BI-RADS score would correlate with a letter grade of a “C” in the educational grading system. This client began lifestyle modifications. Follow up scan: Client initiated an anti-inflammatory diet, increased exercise and hydration and met with a professional to help manage stress and improve sleep cycle. Annual scan: Maintaining lifestyle changes reflected improvement and a lowered risk of breast disease. Letter grade would correlate to an “A/B” rating. Traditional allopathic medicine reminds women to have their annual mammogram and hope that nothing is found. This mindset is a reactive approach to disease. However, every woman can utilize breast thermography to determine risk factors and make changes to diminish them. This is a proactive approach to managing health. Too many women aren’t aware that this technology is available and affordable or they are told by their doctor that “thermography doesn’t work.” Unfortunately, many women stop their research when they hear those words. In the case of certain types of breast disease not seen with mainstream screening, DITI provides a valuable asset to women. 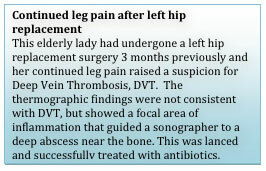 Client, age 38 presented with no family history and no clinical symptoms. Thermal findings were highly suspicious and follow up testing revealed Inflammatory Breast Cancer ~ a highly aggressive form of breast cancer not detected by mammography. This subject presented with NO clinical symptoms (listed above) and was having a routine breast thermogram when this pattern was seen. Immediate clinical correlation revealed IBC and warranted aggressive actions be taken. If you or anyone you know has any of these symptoms, please take action to have a thermal scan (or encourage someone to have a scan) as soon as possible to help rule in/out this very aggressive breast disease. Client, age 32 established stable baseline breast thermogram. This pattern and all temperatures were deemed stable after her initial scan and the required 3 month follow up scan. Annual visit: A new vascular pattern in right breast was noted. Reported lifestyle: poor diet, increased alcohol intake, decreased exercise and disturbed sleep all due to extreme stress associated with her career. Consult with her health practitioner was arranged. Follow up thermogram: Negative for developing pathology. Client was motivated to make lasting lifestyle changes. After leaving her profession and making other significant changes, follow up scans showed thermal patterns had returned to the previously established stable state. Awareness of how the body is reacting to how you manage your stress, what food you choose to put in your body, what quality and amount of sleep you get and many other lifestyle choices is priceless. Using breast DITI helps with “seeing” how your choices are affecting your physiology. Treatment Plan ~ How Well is My Treatment Working? A palpable mass in the upper left breast was accompanied by a faint bruise. Mammogram and sonogram of the mass were performed with negative results. Client continued to seek answers using DITI. Thermal asymmetry of ~ 2.2ºC (ΔT = 2.2ºC) showing a significant thermal asymmetry and more testing was encouraged by the reading thermologist. Diagnostic mammogram with ultrasound and then biopsy confirmed a large carcinoma involving the upper half of the left breast. Client started on chemotherapy to reduce size and consolidate tumor prior to surgery. Two months post-chemotherapy showed decrease in thermal asymmetry now at ~1.2ºC (ΔT = 1.2ºC). Surgeon was encouraged by the response to chemotherapy based on thermographic findings as thermal asymmetry had now fallen to ~ 0.4ºC (ΔT = 0.4ºC) and determined a lumpectomy would be the next step. As you can see in this series of images, DITI can and does cross the boundaries of allopathic and naturopathic medical procedures. While most of our clients utilize the benefits of naturopathic medical procedures, at times, clients will need to act quickly and more conventional measures are needed. Using DITI to “visualize” how well you are responding to treatments can be of benefit to you and your medical doctors. 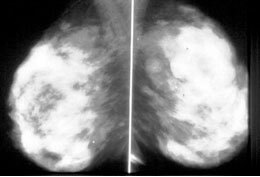 Again, we offer imaging of all different regions, but breast DITI is especially fulfilling and you can see why with these case reports. It feeds our souls and helps us to realize our life purposes to help the many women we have throughout these past 9 years. We want to thank those of you who have shared your experiences with those you know and love to help them see the benefits of this preventative technology. Please continue to pass along to others these newsletters. Several of the clients in these images were encouraged to use DITI for no particular reason, but turned out to be of such significance to the lives’ of each individual shown here. Also, if you have a desire to share your images with others via our newsletters, please let us know. We disclose no names or other identifying information and a consent form is on file before any use of images is done. If your story or situation was especially unique, please reply to this email letting us know of your interest in sharing your journey. Recently, mammography, specifically screening mammography, is falling under scrutiny in the scientific and medical community. As we are aware, mammography is utilized as a screening tool on an annual basis for otherwise healthy women to monitor for any evidence of cancer. A second way mammography is used is in a diagnostic mode. If a woman has a detectable lump, mammography has proven to be effective in detection and ruling-out or ruling-in evidence for exiting disease. It is the debate of the effectiveness of mammography as a screening device that is causing controversy. In this month’s newsletter, we explore this controversial subject. 1. If screening mammography is recommended at age 40, what is the real benefit for this young population of women? The benefit for the younger women, aged 40-49 is actually less than 1% reduction in absolute risk. The data show that the real benefit for number of lives saved by annual mammographic breast screening actually is in women aged 50-74. This data was first reported in 2009 when the US Preventive Services Task Force performed a meta-analysis. The results led them to recommend mammography beginning at age 50 and then alternating years up till age 74. Mammography was not recommended after age 74. Some medical doctors still recommend annual screening mammography beginning at age 40. 2. If “early detection” increases survival, does screening mammography find cancers at “early” stages of development? Some breast cancers are non-progressive, very slow-growing tumors and sometimes characterized as “stationary” tumors. Breast cancers that are described as “turtles” could be found by either breast self exam or clinical breast exam and because of their slow-growing nature could be treated successfully without annual mammograms. Women with this type would not necessarily benefit from annual mammographic screenings. These types of breast cancers are sometimes hibernating or slow-moving tumors. At times they may show no aggression or advancement. However, if awakened, this type can become aggressive, spread and potentially lead to metastatic disease and death. There is a possibility that women with this type could be helped by screenings. Of course, breast density needs to be part of the equation to determine if a woman would benefit from annual mammograms since mammograms are limited by the density of breast tissue. The denser the tissue, the more difficult it would be for a tumor to be seen. Characterized as fast-growing, aggressive tumors these types of breast cancers do not respond to treatment, no matter how small the tumor is when found. Early detection would not play a role in survival as these aggressive tumors develop quickly and no current medical intervention leads to survival. Sadly, women with this type would also not be helped by screening mammography because the end result would be the same. Although we now know about the different types of breast cancers, researchers still cannot distinguish between the different types of breast cancers in how they behave. Statistics show that mammography most effectively detects the slow growing tumors that would be treated successfully regardless of when and how they are found. The majority of the undetected breast cancers didn’t exist at the time of the mammogram. These cancers were found in women who had had regular mammograms, and who were legitimately told that they showed no sign of cancer on their last visit. In the interval between X-rays, however, either they or their doctor had manually discovered a lump in their breast. These tumors were so aggressive that they had gone from undetectable to detectable in the interval between two mammograms. Although the above study is small, the findings with mammography continue to be the same and this is the reason it is now questioned as an effective screening tool for breast cancer. Also, screening mammography has not changed the rate women are diagnosed with late stage cancer or metastatic breast cancer. The decreased rate of death from breast cancer is not due to the screening method but rather, the treatments available. Screening mammography is finding tumors that may not be lethal and creating “over diagnosis” leading to over treatment. Because doctors cannot distinguish between the different types of breast tumors most cases will lead to surgery and possibly radiation and chemotherapy or hormone therapy. Thus, some women are receiving unnecessary treatment that is not beneficial yet carries toxic and significant side effects. Science and technology has a greater understanding that it is the behavior of cancer (Turtle, Bear or Bird) that plays a role in survival, not the size of the tumor. And therefore, for all these reasons above, the use of mammography as a screening tool is questioned. 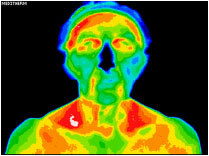 As Level III Clinical Thermographers, we ask ourselves what role thermography may play in these findings. Please look for your April newsletter to discuss this next topic. As we begin 2013, we want to call your attention to a new grading system available to American College of Clinical Thermology (ACCT) thermographers for evaluating breast health that was introduced in the summer of 2012. It is called the Thermography Breast Imaging-Reporting and Data System, also known as T BI-RADS and utilized only by our interpreting physicians at Electronic Medical Interpretation (EMI). In addition, we want to be sure you know what elements comprise your breast health score, what your T BI RADS score means and how to use this grading system to your advantage in monitoring breast health. Historically, the Breast Imaging Reporting and Data System (BI-RADS) was developed by the American College of Radiology in 1993. This system provides a standardized classification for mammographic studies and demonstrates the likelihood of breast malignancy. The BI-RADS system can inform family physicians about key findings, identify appropriate follow-up and management and encourage educational and emotional support to patients. The BI RADS system was developed to standardize mammographic reporting, to improve communication, to reduce confusion, to aid research, and to facilitate outcomes monitoring. Similarly, the T BI-RADS system was designed to help the referring doctor integrate the thermography results into a familiar reporting system. Your T BI RADS score is assigned from all available information including: history and symptoms, the interpreting physician’s clinical impressions from your thermograms and the proprietary software utilized by the EMI doctor. To help you understand your breast health score, we can liken the T BI RADS system to the standard grading system that we use in education: A, B, C, D, and F.
This indicates a normal thermal profile with no thermal findings consistent with risk for disease or other developing pathology. This indicates thermal activity which may be associated with benign changes such as glandular hyperplasia, fibrocystic tissue and the development of cysts and fibroadenomas. This does not rule out existing non-active or encapsulated tumors. (This point will be discussed further in the February Newsletter). These findings indicate thermal activity likely to represent benign changes such as inflammation, acute cysts or fibroadenoma, or infection. This represents a significant risk for existing or developing malignant breast disease. Clinical correlation is justified and additional testing is indicated, including a 3-month follow-up thermogram. This represents a high risk of malignant breast disease; urgent clinical correlation is indicated with a comprehensive panel of testing and evaluation, including a 3-month follow-up thermogram. For the clients who have achieved an "A " on their breast health score, fantastic! Your lifestyle choices that you’ve implemented are contributing to optimal breast health. Keep up the good work! If a client has a known history of fibrocystic changes and/or breast cysts and receives a breast health score of a "B, " we would first encourage you to work with your health practitioner to reverse glandular hyperplasia, fibrocystic changes and the development of cysts and/or fibroadenomas through diet and address any hormonal imbalances. You may also want to rule out estrogen dominance and measure estrogen metabolites. Ultimately, it is possible and advisable to work with your practitioner to optimize your score. If you have a grade of a "C " as your breast health score, it is time to take more proactive measures at reversing the inflammation associated with this process. Estrogen dominance and estrogen metabolism needs to be evaluated as soon as possible. Other contributing factors to this breast health score may include: hormonal imbalances, lymph congestion, inadequate thyroid support, inflammatory diet, overwhelming or poorly-managed stress just to name a few. Ultimately, it gives you an opportunity to discover what pieces of your health you’ve been neglecting or denying. 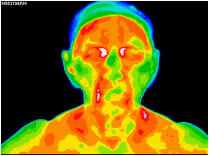 Thermography does not diagnose cancer. This can only be achieved through breast biopsy. If you receive a score of a "D " or an "F, " certainly additional imaging (mammography, MRI and ultrasound) is mandatory. If a positive diagnosis is made, you may want to continue to utilize thermography to monitor for healing after surgery as well as recurrence of cancer. Understand, a grade of "D " or "F " is NOT a positive diagnosis and requires additional information to rule-out or rule-in developing pathology. In summary, thermal imaging is utilized as a tool to watch for changes over time. With continued breast health, the thermograms remain identical to the initial study. Changes may be identified that may represent physiological differences that warrant further investigation. The T BI-RADS gives women an opportunity to improve breast health or maintain their optimal breast health. The T BI RADS System for scoring breast health is only utilized by ACCT thermographers like us at Proactive Health Solutions. The subject of Estrogen Dominance, a phrase coined by John Lee, MD, is so important because of the powerful, yet detrimental, role it plays in the development of cancers found in women (breast, ovarian and endometrial). Estrogen dominance is defined as any amount of estrogen not offset by an adequate amount of progesterone. It's not an exact amount of estrogen that creates an estrogen dominant scenario, but rather, the amount of estrogen relative to the amount of progesterone. For example, a menopausal (or peri-menopausal) woman may have very little estrogen. However, if she is not producing an adequate level of progesterone to offset the estrogen, she may be (or may become) estrogen dominant. As a woman transitions into menopause, progesterone production declines nearly twice as fast as estrogen. This unstoppable, natural process of our biology only partly contributes to an estrogen dominant scenario. Other common contributing factors to creating estrogen dominance are those "consumed" through environmental means called xenoestrogens. "Xeno-"is the Greek word for foreign. Thus, xenoestrogens can be thought of as foreign estrogens. Xenoestrogens are best defined as "hormone disruptors" in that they act at the same site as natural hormones and exert the same effects as any estrogen; cell growth and increased cell division. 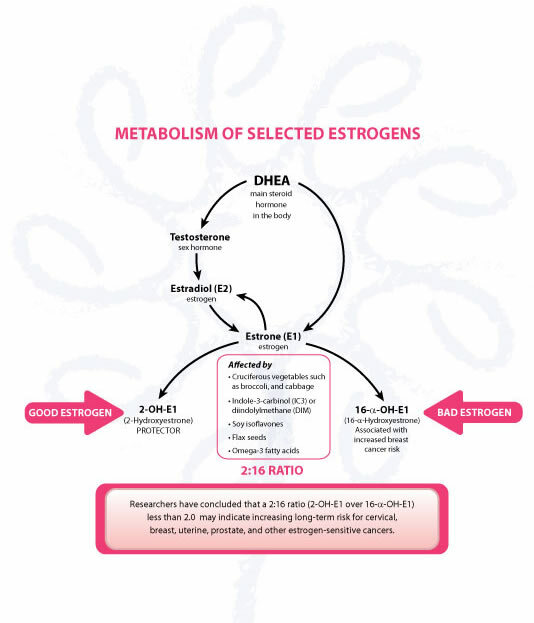 Therefore, estrogen receptors in breast tissue that are occupied by xenoestrogens and not offset by progesterone can lead to several breast conditions including breast cancer. Thus, estrogen dominance puts us at risk for future disease like breast, ovarian and endometrial cancers. Xenoestrogens are found in foods treated with pesticides and insecticides as well as any products that are petroleum-based (called petrochemicals). This list may include: lotions, soaps, shampoos, hair spray, cosmetics, room deodorizers, solvents cleaning products and plastics (water bottles, food-storage containers, etc) are all examples of petrochemicals and therefore foreign estrogens. Of course, not all products are petroleum-based. It is imperative that we read the labels of what we consume, choose non-petroleum based products and limit (ideally, entirely remove) the use of plastics. Stress taxes our adrenal glands which then contribute to decreased progesterone production. Healthy estrogen metabolism - "Estrogen" is actually a combination of three hormones working together to exert their effects. These hormones include Estrone (E1), Estradiol (E2) and Estriol (E3). Estrogens are metabolized through the liver and when hydroxylated, are considered protective (or healthy) and sometimes called our "good" estrogens. End products of this "healthy" arm of estrogen metabolism includes hydroxylated estrone (2-(OH)-estrone) and hydroxylated estradiol (2-(OH)-estradiol). Healthy estrogen metabolism is favored by adequate Vitamin D levels, adequate Vitamin B6 and Magnesium levels as well as consuming foods high in indol-3-carbinol such as cabbage, broccoli, collard greens, kale, turnip root and rutabaga as well as other cruciferous vegetables. Some practitioners may request that you add Di-indolylmethane or DIM as this is the beneficial ingredient found in cruciferous vegetables that supports healthy estrogen metabolism. Another end-product of estrone metabolism is 16-alpha-hydroxylated estrone (16α-(OH)-estrone) or "bad" estrogen. The ideal situation is to have a higher ratio of healthy metabolites to unhealthy metabolites. This ratio can be measured through blood or urine. Recommendations are then made to alter the ratio if necessary via diet, supplements and/or adding natural hormone support. Other beneficial modalities may be considered (yoga, meditation, acupuncture, etc) too. 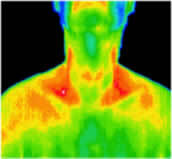 Estrogen dominance and thermal imaging - Thermal imaging cannot "diagnose" estrogen dominance. However, as a powerful tool for preventing the development of disease, thermal imaging can be your best ally in monitoring for any changes related to your breast health. For example, let's say you've maintained stable thermal patterns for several years. At your annual appointment, the thermogram indicates a change from your previous stable thermal patterns. The risk for developing breast cancer is increased with estrogen dominance. Thus, it is prudent to make an appointment with your physician to rule out estrogen dominance. Talk to your nutritionist or physician about dietary changes that can benefit the healthy arm of estrogen metabolism. If stress may be a contributing factor, consider what changes can be made to manage the situation better. If you plan to make lifestyle modifications for the New Year I hope you will become more aware of environmental estrogens that may be feeding an unhealthy process and resolve to live healthfully in 2013 and beyond! A urine sample can measure your estrogen metabolites and determine the ratio of "good estrogen" to "bad estrogen" in your body. Studies have shown this ratio provides an important indication of risk for future development of breast cancer. A low 2:16 ratio can indicate increased long-term risk for breast cancer as well as other estrogen-sensitive cancers including uterine, ovarian, cervical, prostate, and even head and neck cancers. One of the best features of this test is that the metabolites can be measured and lifestyle changes can be modified to favor a healthier ratio. To find out more information about this test please click here. Consider asking your health practitioner for more information about his test and if there are any drawbacks to requesting this test.